Chameleons hold a unique niche in the reptile world. People are drawn to them because they are like nothing else on the planet! There are other animals that share that same quality. The passion for the unique that draws people to chameleons also creates interest towards other creatures that inhabit the outer fringes of nature. In this regular column we have invited chameleon keepers who have explored other corners of the animal world to share their experiences and offer insight from a chameleon keeper's frame of mind. In my many years of keeping chameleons, I had been one of the few reptile hobbyists I knew that had never worked with any other species of reptile. I was, what some would say, a purist. I never had any real motivation to go beyond the world of chameleons. Then a change took place thousands of miles away from my home in California. It was during my third trip to Madagascar that I found my way to exploring the world beyond chameleons. While visiting a chameleon farm on the way to Perinet, I had my first encounter. 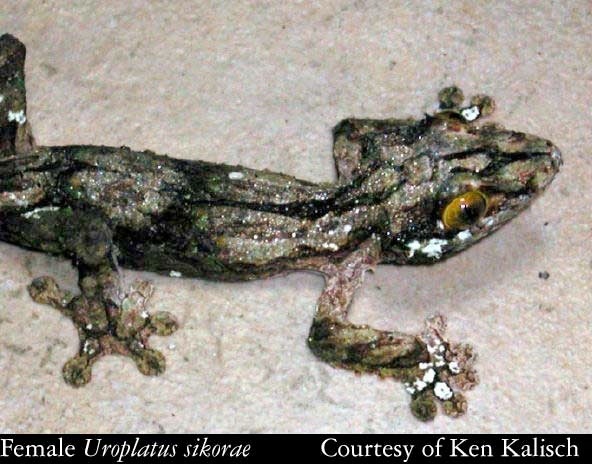 It was a juvenile uroplatus sikorae that won me over. The reptile was only 4" total length and was the color and look of mossy bark and it felt like velvet to the touch. I had never experienced anything quite like it before. My next encounter occurred as I was doing a nocturnal search for chameleons in Ranomafana Park. 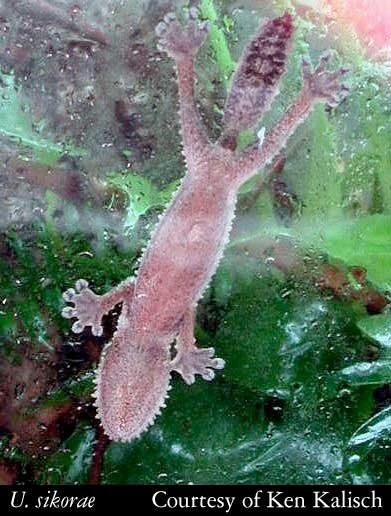 Our guide found an amazing little gecko in the branches of a small tree. 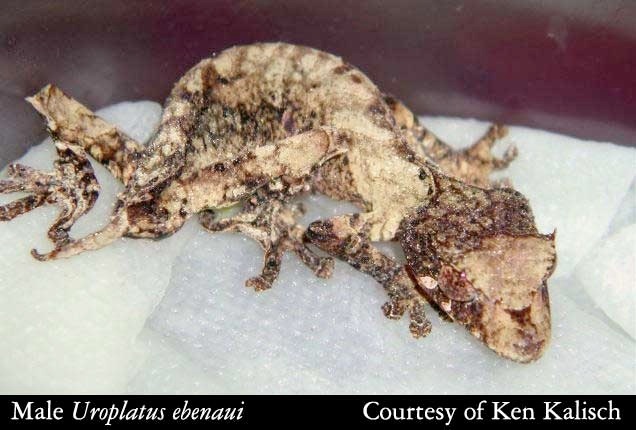 It was a uroplatus ebenaui. This amazing creature was so incredible in its structure and movement. Truly, I was caught in the gaze of another reptile that had evolved to fill a unique niche like so many others in Madagascar's fauna. Something just clicked and I knew I was a goner! During the trip I had the good fortune to encounter several species of uroplatus: uroplatus ebenaui, uroplatus fimbriatus, uroplatus lineatus, uroplatus phantasticus and uroplatus sikorae. They each held a unique fascination to me and only added fuel to my fires of interest. I was resolved by the end of the trip to return home and research more about them. Upon my return to the States, much to my surprise, I found that there was very little written info on any of them. I felt much like I did when I started with chameleons. There was no real hard data. The reference material had limited information and, again, like the chameleons, was cryptic at best. I got my hands on everything and everyone I could find and read and asked questions about the uroplatus. Armed with my base information and a reasonable amount of confidence in that fact that I had kept chameleons for almost ten years, I decided to purchase several groups. 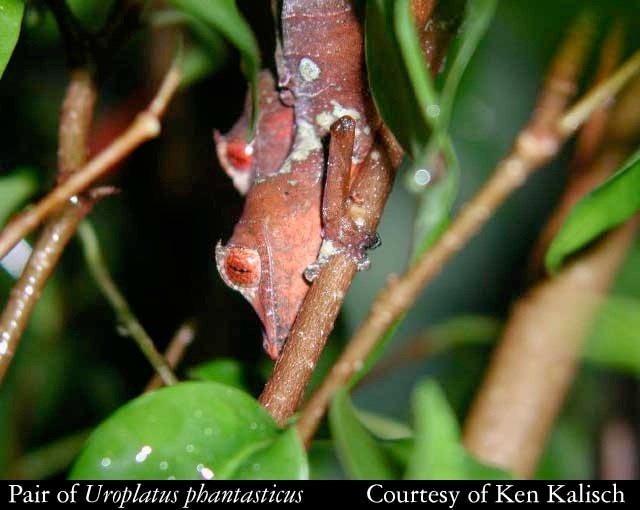 I settled on uroplatus ebenaui, uroplatus phantasticus, and uroplatus sikorae. The first thing I had to come to terms with was how to house them. 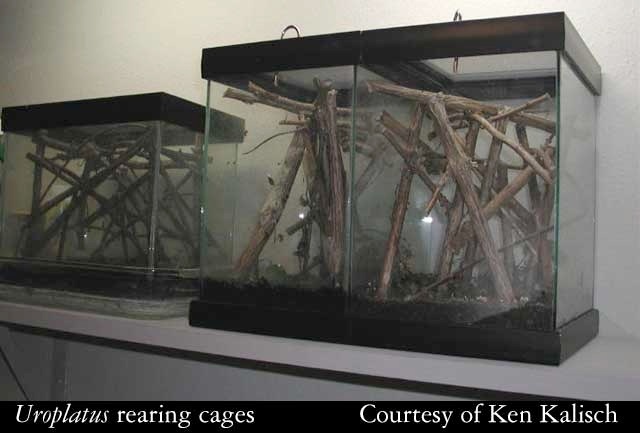 I had always used all-screened cages with my chameleons, so part of me was conflicted with the recommendations of using all-glass caging. Because I did have some reservations with an all glass cage, I compromised with three sides Plexiglas with the front and top made of plastic screen. 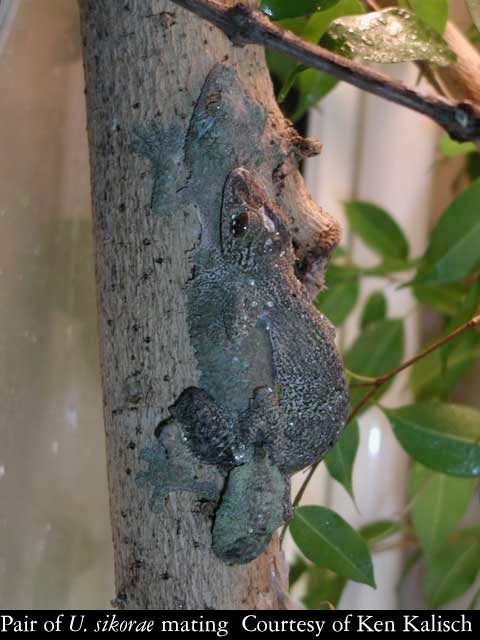 This was the first of several challenges I faced in converting my "chameleon knowledge" to the uroplatus. Much of the chameleon basics translated well, the use of living plants as well as branches and the proper lighting. I did have to rethink the cage setup in general. They would need vertical branches that would allow them a place to rest upon as opposed to the foot/grip issue with chameleons. This also meant that the branches would need to have a much larger circumference than with the chameleons. 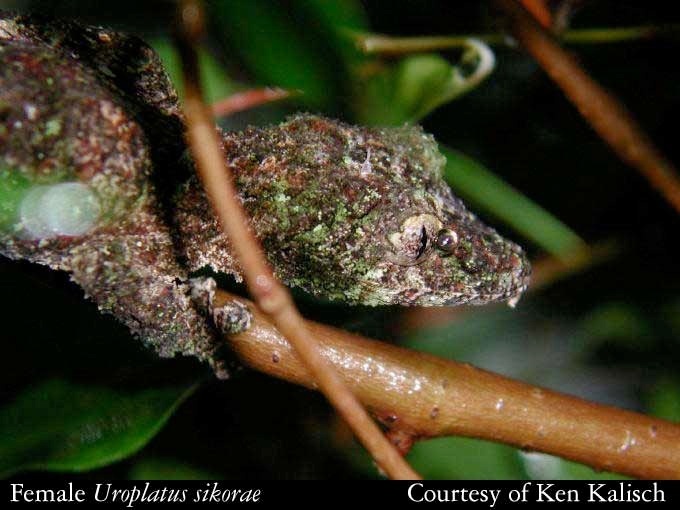 The other and most obvious was that the uroplatus were nocturnal and the chameleons were diurnal. The watering application was the same as with the chameleons, a combination of a dripping source and misting the cage several times a day, but the time it was done was changed to early mornings and the evenings, after the lights went out. 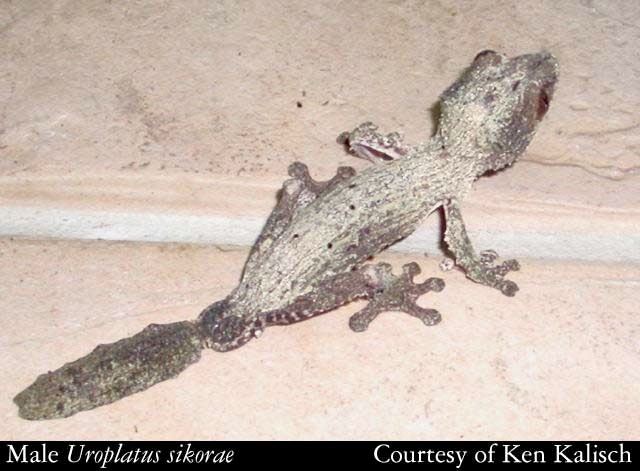 Their feeding times were also opposite, as well as an increase in the amounts of supplemented calcium in the geckos diet. Everything came together and I was ready for the lizards. 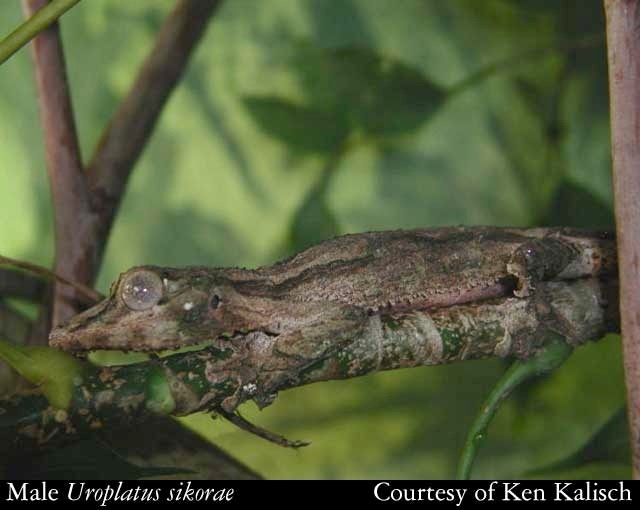 The uroplatus sikorae were by far my favorites. I purchased a group of 2:3. They were set up in a tall Plexiglas/screened cage. The cages dimensions are 2' W x2' D x 6' H (.609 m- W x .609 m- D x 1.8288 m- H ). It was filled with Ficus benjamina, bromeliads and lots of vertical sloping branches. The lighting was a combination of halogen spotlights and 3 - 24" fluorescent fixtures with Reptisun 5.0 ®bulbs. Because the acquisitions were new imports, they were checked and treated for parasites. With this taken care of, the lizards seemed to settle in well to their new environment and within a month, they were actually accepting food from my fingers. The insect foods offered were crickets, waxworms, walking sticks and small roaches. Their food was regularly dusted with calcium and a twice a month dusting of other minerals and vitamins. Over the next year the group settled in to their new environment very well. They were seen foraging at night for their food and on occasion, copulation was observed. There was little inter-aggression in the group. An occasional territorial scrap between the males was seen, but this simply consisted of a quick lunge towards each other, a slight warning vocalization and then they would go off their separate ways. 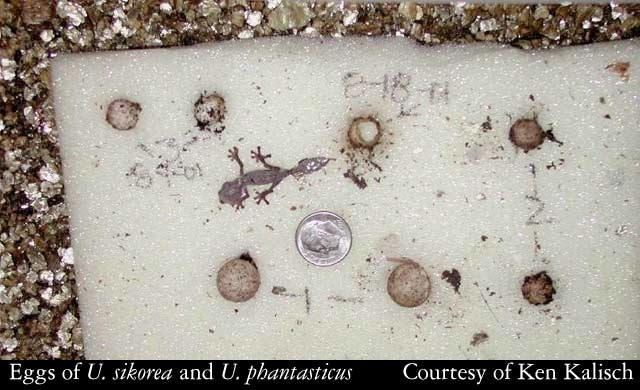 During this time the females were observed depositing eggs on the soil substrate of the cage floor. Carefully rolling the newly laid eggs with their hind eggs to cover them with soil. They fairly regularly laid two eggs at six to eight week intervals, with a secession of egg laying occurring for about thee months during the hotter summer months. The incubation of the eggs was similar to that of what I had done with my clutches of chameleons using vermiculite as the base medium in a Tupperware type container with a dozen pinholes made in the containers lid. 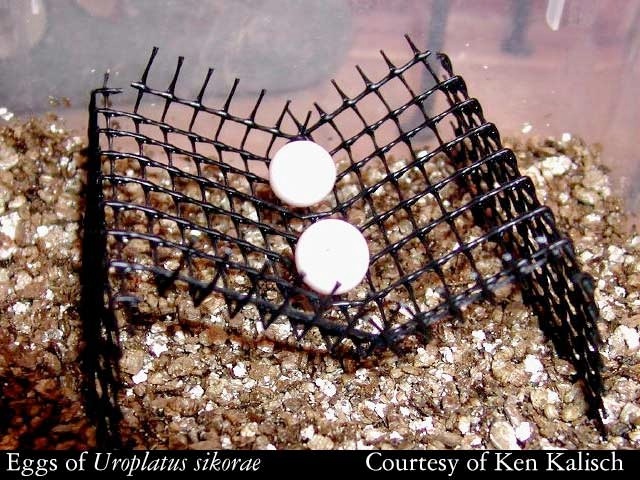 The real variation in incubation, suggested by a gecko-keeping friend, was to place the eggs off the vermiculite, hanging the eggs in a wire holding basket above the moistened vermiculite. This was to prevent any softening or rotting of the eggs shell that could occur from possible overly moist conditions. The eggs were incubated at cool temperatures ranging from 60° F( 15.5°C )to 72° F( 22.2 °C ). The hatchlings successfully emerged at about 6 months at the lower temperature range and at 3 months at the higher end of the range. 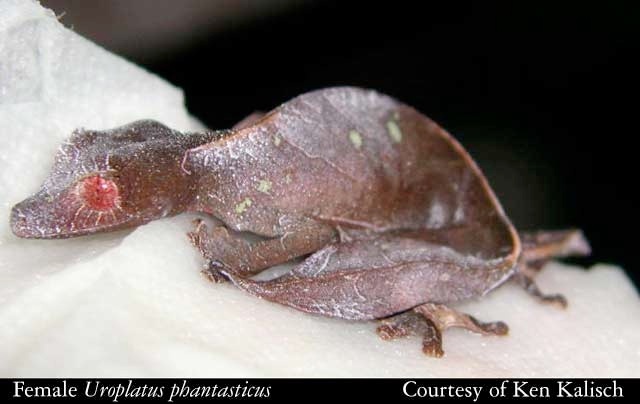 The growth of the neonates progressed well and the first hatched are almost adult size in seven months. I truly have enjoyed my venture into another realm of the reptile world. My only regret is that it took me so long to make the leap! 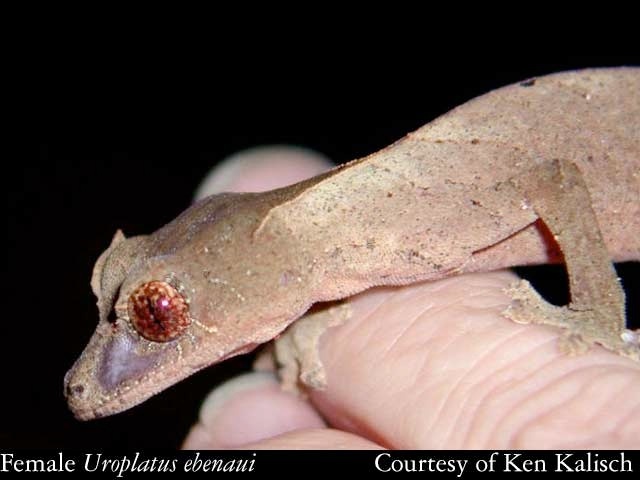 These creatures are a very fascinating and a highly recommended species for anyone that has consider working with the uroplatus group of geckos.